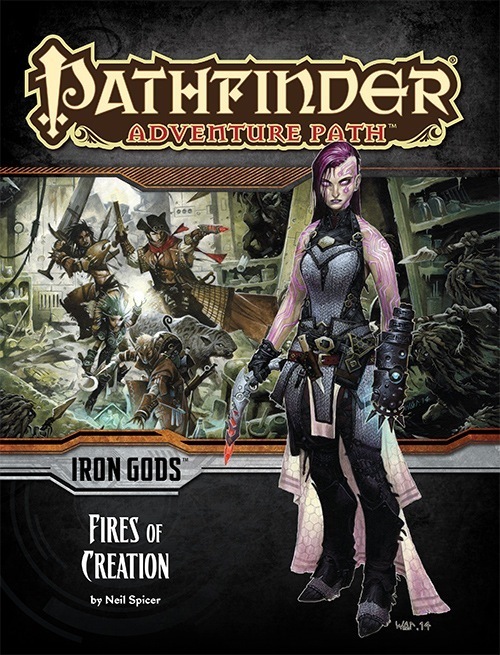 The Iron Gods Adventure Path begins with "Fires of Creation," an exciting new adventure set in Numeria, land of barbarians and super-science! In the town of Torch, the settlement's unignorable tower of violet flame has gone out. The only clue to its disappearance is a newly discovered cave dug nearby. Are the heroes bold enough to unearth the otherworldly secrets that sleep beneath the city and reignite the fires of Torch? Or will their first foray into Numeria's ancient mysteries be their last? "Fires of Creation," a Pathfinder adventure for 1st-level characters, by Neil Spicer. A Gazetteer of the Numerian town of Torch, by Neil Spicer. A look into the mysteries of artificial life with an ecology of androids, by Russ Taylor. A bittersweet homecoming for a Numerian explorer in the Pathfinder's Journal, by Amber E. Scott. A host of new monsters, by Neil Spicer, Mark Garringer, and Mike Welham. "Fires of Creation" is sanctioned for use in Pathfinder Society Organized Play. The rules for running this Adventure Path and Chronicle sheet are available as a free download (874 KB zip/PDF). I ran a group of 4 experienced, but non-optimizing players through this adventure and did all encounters as written. After we finished this adventure, I asked my players to give me some feedback on the adventure itself and they all agreed that it was extremely hard, especially in the beginning. And I have to agree: Creatures with 4 attacks at level 1? Hardness 10 creatures vs. a level 2 party? Skill check DCs of up to 30 at level 3? Sure, there are ways to make the tasks easier and I actually applaud this method: set the DC very high but be generous with circumstance bonuses (up to +10 from a single source) that can reduce it to almost trivial levels. It forces players to think in in-game terms and draws them away from their character sheet and pure mechanics. But not every group is going to like this. The creature with hardness, however, is a very serious threat and almost impossible to overcome for low-level PCs. Make sure you work with your players and give some friendly tactical advice when they appear to get stuck. Even though I tried to help them as best as I could without too much handholding, we had a TPK at level 1 and several near-TPKs in the rest of the adventure. If your group is not into that sort of threat level, make sure to tone down the encounters somewhat. I even have to go as far and subtract a star for the difficulty level because one of my players got so frustrated after his character died that he returned with the strongest character build he could find online. That should not happen! It may be on me as the GM to let it get that far, but the adventure as written should not be so frustrating that you feel you have to choose the powerful over the flavorful options to survive. Story-wise, it is a very fun exploration of a technological ruin/dungeon. The tech level slowly increases over the course of the adventure, making this a great introduction to Science Fantasy. The descriptions of the rooms are also written from a tech-ignorant perspective. In the beginning, this was a lot of fun as players and characters alike were trying to figure out what exactly the things in front of them did. But by the end of the adventure, when several people have picked up the Technologist feat, some ranks in Knowledge (engineering) and maybe even speak Androffan, the point-of-view of a technological ignoramus becomes a bit annoying because at that point everyone knows that it is a computer screen and it becomes tiring to have descriptions of "glowing glass panels with strange writing"). I know, I can of course paraphrase the boxed text, but I felt like the adventure could have handled this a bit more gracefully on its own. All in all, we still had a great time with this one but there were a few frustrating moments due to the high difficulty levels. If you have a group of experienced players who have a certain level of system mastery, go ahead and add a star. For us, it was a 4 star experience. 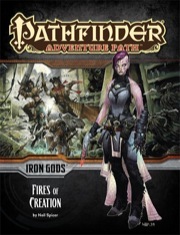 Fires of Creation is the first part of the Iron Gods Adventure Path, which fully embraces the guns, androids, and spaceships part of the campaign setting. This is not the first appearance of such elements, but it is the first to make them a significant focus. As such, it's not an adventure path that will necessarily appeal to people who don't like to mix science fiction and fantasy. However, for those who do, or for those willing to give it a try, Fires of Creation makes a great starting point. It's a somewhat “sandboxy” adventure that introduces standard fantasy player characters to a wider world of technology and science fiction. Let me first say I haven't GM'ed an RPG (any RPG) in almost 20 years. My kids recommended Pathfinder as a "Classic" Fantasy RPG system that would be most familiar to me. My challenge was to find a beginner's module that would be engaging, relatively well fleshed out, and yet tolerant of a rusty GM new to the Pathfinder system. Fires of Creation has met those criteria, and more! As someone who has spent a career in robotics and the Space industry, I have always like mixing technology in to Fantasy RPGs. This module allows me to be creative in adding depth and color within a well flushed out system for incorporating technology. There is sufficient backstory to allow the GM to frame the roleplay in an obviously consistent way. The town of Torch is developed well enough to be a reasonable sandbox, yet quite a few "triggers" are built in as the storyline progresses. I also found the campaign "traits" to be very helpful in tying new characters in to the storyline. In this module, the game mechanics are relatively straightforward enough for me to learn the details of Pathfinder system. As this Adventure Path progresses I am sure that will change, but by then I'll be buffed up! We've had three sessions and my players are eager to find out what happens next. The encounters have been challenging and rewarding for them. I would highly recommend "Fires of Creation" and am hoping future modules meet the high bar set here! This is an excellent start to the Iron Gods AP. The events of this book introduce the key players quite well, via an interesting story and a fun adventure. Things are weird, but there aren't any moments that feel like filler. Will I Dream, Dave? Yes I Will! An excellent kick-off to an excellent Adventure Path. This adventure goes from a more orthodox Pathfinder adventure with working with townspeople against a gang of thugs and delving dungeons and fighting cave-dwelling monsters to exploring the fantastical world of technology that only this adventure path could really provide. It's an excellent transition adventure to let players know that we are still in Pathfinder, but we are not completely on Golarion anymore. Numeria has everything I've wanted in an Adventure Path and this book is an excellent jumping-off point for an adventure unlike any other! I was thrilled about "The Mummy's Mask", but "Iron Gods" has me uber-super-excited. 24 people marked this as a favorite. she took one look one look at the announcement and simply said, "I will GM that for you and the rest of the group so that you can play in it." Oh nice. I'm looking forward to this! Okay, so I was right about this one being set in/around Torch. I have to double check, but it seems to me that the Inner Sea World Guide mentioned undead around Torch. Maybe we'll see some good old fashion radioactive zombies in this one? Nice to see Mr. Spicer is in demand and keeping busy with the writing projects. Way to go! No mention of undead in the Inner Sea World Guide around Torch. There's some undead involved anyway. Ah, can't remember where I got that impression. Lock S-foils in attack position. We're passing through the magnetic field. Hold tight. Switch your deflectors on...double front. Accelerate to attack speed! This is it, boys! This is some coolness, and an opening Chapter from Mr Neil Spicer is something to get excited about no matter the AP. Robuts, Spaceships and Magic oh my! Oh man, I can't wait! Bring on the force swords and armor! Thanks for the Iron Gods soundtrack link Mikaze. Description says "suddently" I think it should be "suddenly"
I am even more excited about this one then the Osirion AP. Seriously, I cannot wait for this. It's going to be so much awesome that I think my head will explode. And I'm secretly hoping for a nuke. I really, really want a nuke. Or a bunch of them. I wanna pull an Urza on the Abyss after reading through WotR. Oh, so this AP is an April Fool's joke? All these announcements were made yesterday. Anyway, I was only half-serious. Haven't been as excited about a PF AP as I am about this one. Thank you James Jacobs for pushing the envelope. I want this. like, now. My body is ready. I can't wait to get a chance to play this in October. Self Indulgent Space Opera Metal. It's more my style. Better suited for laser battles methinks. So, so, so excited about this one! A gazetteer of the city of Torch and an exploration into the nature of the strange androids of Numeria round out this volume, along with the first installment of Amber Scott’s new Pathfinder Journal and several new monsters of alien and technological nature. Does this mean that Amber Scott will be doing all the AP fiction now? Please! Please! This looks fantastic. I can't wait. She's doing the Pathfinder's Journal for Iron Gods for sure, but I have a slightly different plan for the following Adventure Path. I hope you will have a lot of copies of this at GenCon because even if I get screwed on going this year someone is going to pick me up a copy. I can feel my wallet grow lighter on every occasion that OSW ermagherds. I have literally been mugged and felt more financially secure. damn you paizo, now take my money. I'll be at the Paizo booth hopefully selling the heck out of this thing. Have your friend track me down and I'll sign it for you. Ayreon has written seven linked folk metal Rock Operas About Space Aliens. In case you haven't seen this before: You're welcome. Of Particular importance are "The Human Equation" and "01011001". They will be my backing music for Iron Gods. This is a MUST HAVE for me. Has it struck anyone else that the plot of Ayeron's "Into the Electric Castle" would make an awesome campaign. Not until you said it then, but I'm already drooling about it. I might have a crack over the Australian winter holidays. Trivia: did you know they Arjen Lucassen named his home recording studio "The Electric Castle"? Really excited about this one. I've wanted to play a swords & lasers game since... Well... Since I was a kid who loved this show on Saturday morning TV.